Vashon, or Vashon Island, is the largest island in the southern portion of the Puget Sound. It is located just off the coast of Seattle and mainland Washington state and is considered a part of King County. The island is only accessible via ferry and has remained largely rural and agricultural, despite several major industrial companies setting up shop here. Tourism is another big industry on Vashon. Described as somehow both “quaint” and “eclectic”, visitors find small town charm and plenty of activity that its residents are proud of. 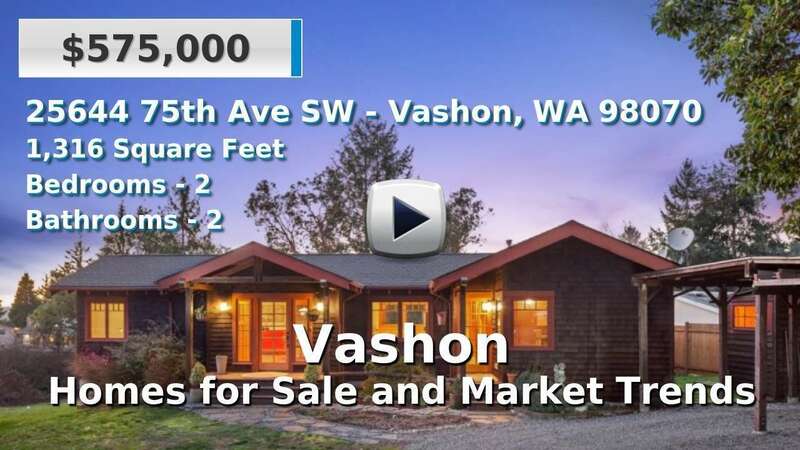 Homes for sale on Vashon are a bit older than the average, but as expected, many offer breathtaking views, acreage or waterfront lots. It is a popular place to escape the big city after a ferry commute home from work. 3 Beds | 2 Baths | 2230 sq. Ft.
4 Beds | 3 Baths | 3090 sq. Ft.
2 Beds | 1.75 Baths | 1180 sq. Ft.
4 Beds | 2 Baths | 2490 sq. Ft.
4 Beds | 4 Baths | 5170 sq. Ft.
3 Beds | 4 Baths | 3820 sq. Ft.
2 Beds | 1.75 Baths | 1160 sq. Ft.
3 Beds | 1.5 Baths | 1760 sq. Ft.
4 Beds | 4.25 Baths | 6700 sq. Ft.
3 Beds | 2 Baths | 1740 sq. Ft.
2 Beds | 1 Baths | 1060 sq. Ft.